FIGURE 16 ■ Computed tomographic images before (A) and one month after (B) right laparoscopic renal cyst ablation of a peripelvic and large peripheral cyst causing obstruction and symptoms of right flank pain. Note complete ablation of right-sided cysts and resolution of obstruction. Left-sided cysts were left untreated because these were asymptomatic. During the retroperitoneal approach, identification of as many of the retroperitoneal landmarks including the psoas and quadratus lumborum muscles, pulsations of the renal artery, ureter, vena cava (right-sided dissection), and aorta (left-sided dissection) is important to properly orient the surgeon to the location of the kidney and associated cysts. 40 pumps of the sphygmomanometer bulb) under laparoscopic view to develop the retroperitoneal working space. A second more cephalad inflation with the balloon dilator may be required to gain exposure and access upper-pole renal cysts. After removal of the balloon dilator, a 10-mm balloon-cuffed trocar can be inserted and inflated (30 cc air) snug beneath the abdominal fascia to prevent gas leakage during the operation. Alternatively, a standard 10/12-mm trocar may be inserted with 2-0 polyglactin sutures used to cinch the abdominal fascia snug with the trocar to minimize loss of pneumoperitoneum. A second 10/12-mm trocar is placed under laparoscopic view or alternatively digital guidance, along the anterior axillary line and three fingerbreadths cephalad to the iliac crest. One must be sure that the peritoneum has been adequately mobilized medially to prevent transperitoneal placement of this trocar. Lastly, a 5-mm trocar is placed at the junction of the lateral border of the erector spinae muscle and the underside of the 12th rib. The final trocar configuration is as shown in Fig. 6. The distance between trocars should ideally be at least three to four fingerbreadths to minimize trocar and instrument collision. As the working space is smaller and landmarks less distinct as compared to the transperitoneal technique, great care must be taken to avoid mistaking the liver (during right-sided dissection) or spleen (during left-sided dissection) for renal parenchyma. 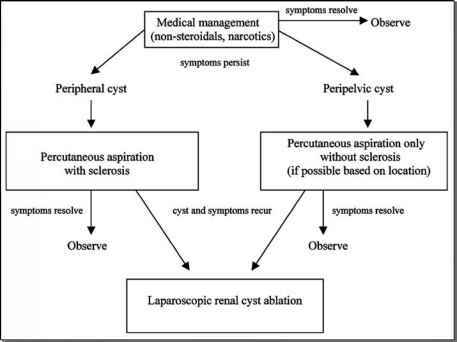 During the retroperitoneal technique, reflection of the colon is unnecessary and therefore following trocar placement and development of the retroperitoneal working space, the operative steps follow that are listed in Table 3 starting with Step 3.